The conservation of Lincoln Castle delivered by Woodhead Heritage has been marked by a Royal visit. Her Royal Highness then unveiled a plaque commemorating the occasion, before taking a tour of the site, including a visit to the David PJ Ross Magna Carta Vault, a new home for the historic document, made possible thanks to a £1.4m donation from the David Ross Foundation. As part of her visit she met some of the construction team who worked on the project including Simon Butler, Conservation Manager, Site Managers Richard Carlton and Richard Savage of Woodhead Heritage and David Woodhead, Managing Director of Robert Woodhead Limited.Cllr Martin Hill, Leader of Lincolnshire County Council, said: “Lincoln Castle Revealed has transformed this site into a world-class tourist attraction, and, in our first two months, we have already welcomed more than 60,000 visitors through the gates. Best moments: Working on a project like this was a childhood dream. While the Castle is beautiful, and revealed in every sense, my enduring memory will always be managing a team who’s enthusiasm, passion & belief never wavered regardless of what the site threw at them. Challenging moments: There haven’t been many. If I had to choose one, it would be when we realised that the Saxon sarcophagus was cracked – it had been a long day, we were cold, and wet, but we still managed to come up with a plan which revealed some spectacular secrets! Best moments I’ve been working on Lincoln Castle for over three and a half years with loads of best moments . every day was a joy to work on such a beautiful project. One of the best was when the spiral stairs and the link bridge to the east wall was installed and being the first person to go up the stairs and walk over the bridge and walk all the way around the walls. An immense sense of pride on walking the walls all the way round for the first time. Worst moments: I can honestly say none. 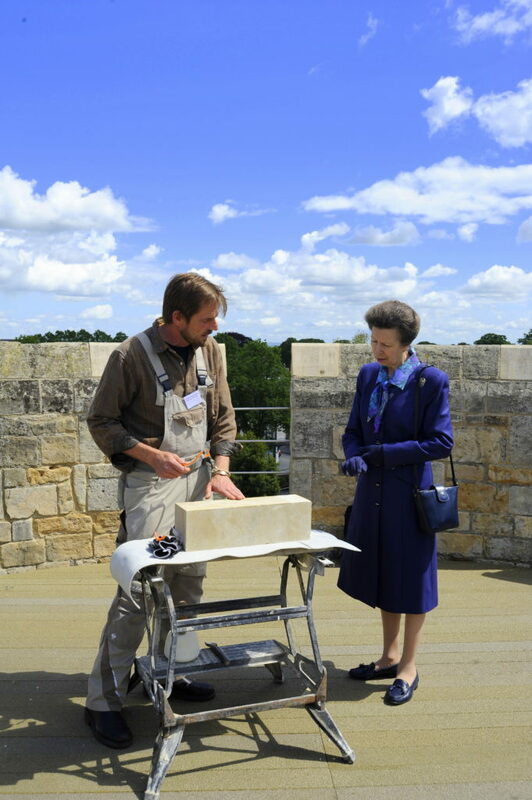 Pictured: Heath Shakespeare, Head Mason on the project meets Her Royal Highness.